ProSlice: Photo includes over 30 different framed layouts. Final Cut Pro X users can easily change the animation with the use of a simple drop down menu. Intro and outro animations come with adjustable controls to create dynamic transitions between media and scenes in FCPX. 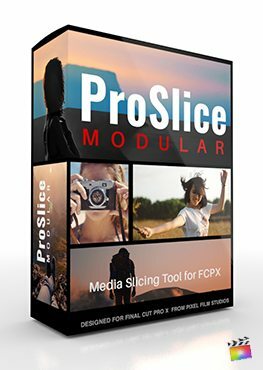 ProSlice: Photo includes multiple layout guides that make creating a collage quick and easy. Guides range from 2 to 6 Drop Zone layouts and a grid guide. Layout guides have easy to use dropdown menus that allow FCPX users to see various layouts with color coded shapes. Select any layout then click and drag the corresponding shape using the positions to match the layout guide. As a result layout guides and pre-made shapes cut setup time drastically. Various framing animations and styles come with adjustable controls to create any type of scene. ProSlice: Photo is packaged with fully adjustable presets and 10 shape variations. For example, pre-made shapes allow editors to quickly set up complicated layouts in Final Cut Pro X. However editors never have to painstakingly scale and adjust the positions of each drop zone to make layouts. In addition, select any shape preset and use provided drop down menus to quickly select the start, mid and end position of shape preset in a perfectly symmetrical layout. ProSlice: Photo is a unique layout toolset designed specifically for Final Cut Pro X. Presets contain animation, frame and shadow controls for users to create any type of layout. To summarize, creating a photo or video collage layout in Final Cut Pro X has never been easier thanks to ProSlice: Photo. Where do I find ProSlice: Photo? Once the installation is complete, you can find ProSlice: Photo in the FCPX Generators library.